You can filter network traffic to and from Azure resources in an Azure virtual network with a network security group. A network security group contains security rules that allow or deny inbound network traffic to, or outbound network traffic from, several types of Azure resources. To learn about which Azure resources can be deployed into a virtual network and have network security groups associated to them, see Virtual network integration for Azure services. For each rule, you can specify source and destination, port, and protocol. This article explains network security group concepts, to help you use them effectively. If you've never created a network security group, you can complete a quick tutorial to get some experience creating one. If you're familiar with network security groups and need to manage them, see Manage a network security group. If you're having communication problems and need to troubleshoot network security groups, see Diagnose a virtual machine network traffic filter problem. You can enable network security group flow logs to analyze network traffic to and from resources that have an associated network security group. Name A unique name within the network security group. Priority A number between 100 and 4096. Rules are processed in priority order, with lower numbers processed before higher numbers, because lower numbers have higher priority. Once traffic matches a rule, processing stops. As a result, any rules that exist with lower priorities (higher numbers) that have the same attributes as rules with higher priorities are not processed. Source or destination Any, or an individual IP address, classless inter-domain routing (CIDR) block (10.0.0.0/24, for example), service tag, or application security group. If you specify an address for an Azure resource, specify the private IP address assigned to the resource. Network security groups are processed after Azure translates a public IP address to a private IP address for inbound traffic, and before Azure translates a private IP address to a public IP address for outbound traffic. Learn more about Azure IP addresses. Specifying a range, a service tag, or application security group, enables you to create fewer security rules. The ability to specify multiple individual IP addresses and ranges (you cannot specify multiple service tags or application groups) in a rule is referred to as augmented security rules. Augmented security rules can only be created in network security groups created through the Resource Manager deployment model. You cannot specify multiple IP addresses and IP address ranges in network security groups created through the classic deployment model. Learn more about Azure deployment models. Protocol TCP, UDP, or Any, which includes (but not limited to) TCP, UDP, and ICMP. You cannot specify ICMP alone, so if you require ICMP, use Any. Direction Whether the rule applies to inbound, or outbound traffic. Port range You can specify an individual or range of ports. For example, you could specify 80 or 10000-10005. Specifying ranges enables you to create fewer security rules. Augmented security rules can only be created in network security groups created through the Resource Manager deployment model. You cannot specify multiple ports or port ranges in the same security rule in network security groups created through the classic deployment model. Network security group security rules are evaluated by priority using the 5-tuple information (source, source port, destination, destination port, and protocol) to allow or deny the traffic. A flow record is created for existing connections. Communication is allowed or denied based on the connection state of the flow record. The flow record allows a network security group to be stateful. If you specify an outbound security rule to any address over port 80, for example, it's not necessary to specify an inbound security rule for the response to the outbound traffic. You only need to specify an inbound security rule if communication is initiated externally. The opposite is also true. If inbound traffic is allowed over a port, it's not necessary to specify an outbound security rule to respond to traffic over the port. Existing connections may not be interrupted when you remove a security rule that enabled the flow. Traffic flows are interrupted when connections are stopped and no traffic is flowing in either direction, for at least a few minutes. There are limits to the number of security rules you can create in a network security group. For details, see Azure limits. Augmented security rules simplify security definition for virtual networks, allowing you to define larger and complex network security policies, with fewer rules. You can combine multiple ports and multiple explicit IP addresses and ranges into a single, easily understood security rule. Use augmented rules in the source, destination, and port fields of a rule. To simplify maintenance of your security rule definition, combine augmented security rules with service tags or application security groups. There are limits to the number of addresses, ranges, and ports that you can specify in a rule. For details, see Azure limits. A service tag represents a group of IP address prefixes to help minimize complexity for security rule creation. You cannot create your own service tag, nor specify which IP addresses are included within a tag. Microsoft manages the address prefixes encompassed by the service tag, and automatically updates the service tag as addresses change. You can use service tags in place of specific IP addresses when creating security rules. You can download and integrate with an on premises firewall the list of service tags with prefix details on the following weekly publications for Azure Public, US government, China, and Germany clouds. The following service tags are available for use in security rule definition. Their names vary slightly between Azure deployment models. VirtualNetwork (Resource Manager) (VIRTUAL_NETWORK for classic): This tag includes the virtual network address space (all CIDR ranges defined for the virtual network), all connected on-premises address spaces, and peered virtual networks or virtual network connected to a virtual network gateway and address prefixes used on user defined routes. AzureLoadBalancer (Resource Manager) (AZURE_LOADBALANCER for classic): This tag denotes Azure's infrastructure load balancer. The tag translates to the Virtual IP address of the host (168.63.129.16) where Azure's health probes originate. If you are not using the Azure load balancer, you can override this rule. Internet (Resource Manager) (INTERNET for classic): This tag denotes the IP address space that is outside the virtual network and reachable by the public Internet. The address range includes the Azure owned public IP address space. AzureCloud (Resource Manager only): This tag denotes the IP address space for Azure including all datacenter public IP addresses. If you specify AzureCloud for the value, traffic is allowed or denied to Azure public IP addresses. If you only want to allow access to AzureCloud in a specific region, you can specify the region. For example, if you want to allow access only to Azure AzureCloud in the East US region, you could specify AzureCloud.EastUS as a service tag. AzureTrafficManager (Resource Manager only): This tag denotes the IP address space for the Azure Traffic Manager probe IP addresses. More information on Traffic Manager probe IP addresses can be found in the Azure Traffic Manager FAQ. Storage (Resource Manager only): This tag denotes the IP address space for the Azure Storage service. If you specify Storage for the value, traffic is allowed or denied to storage. If you only want to allow access to storage in a specific region, you can specify the region. For example, if you want to allow access only to Azure Storage in the East US region, you could specify Storage.EastUS as a service tag. The tag represents the service, but not specific instances of the service. For example, the tag represents the Azure Storage service, but not a specific Azure Storage account. Sql (Resource Manager only): This tag denotes the address prefixes of the Azure SQL Database, Azure Database for MySQL, Azure Database for PostgreSQL, and Azure SQL Data Warehouse services. If you specify Sql for the value, traffic is allowed or denied to Sql. If you only want to allow access to Sql in a specific region, you can specify the region. For example, if you want to allow access only to Azure SQL Database in the East US region, you could specify Sql.EastUS as a service tag. The tag represents the service, but not specific instances of the service. For example, the tag represents the Azure SQL Database service, but not a specific SQL database or server. AzureCosmosDB (Resource Manager only): This tag denotes the address prefixes of the Azure Cosmos Database service. If you specify AzureCosmosDB for the value, traffic is allowed or denied to AzureCosmosDB. If you only want to allow access to AzureCosmosDB in a specific region, you can specify the region in the following format AzureCosmosDB. [region name]. AzureKeyVault (Resource Manager only): This tag denotes the address prefixes of the Azure KeyVault service. If you specify AzureKeyVault for the value, traffic is allowed or denied to AzureKeyVault. If you only want to allow access to AzureKeyVault in a specific region, you can specify the region in the following format AzureKeyVault. [region name]. EventHub (Resource Manager only): This tag denotes the address prefixes of the Azure EventHub service. If you specify EventHub for the value, traffic is allowed or denied to EventHub. If you only want to allow access to EventHub in a specific region, you can specify the region in the following format EventHub. [region name]. ServiceBus (Resource Manager only): This tag denotes the address prefixes of the Azure ServiceBus service using the Premium service tier. If you specify ServiceBus for the value, traffic is allowed or denied to ServiceBus. If you only want to allow access to ServiceBus in a specific region, you can specify the region in the following format ServiceBus. [region name]. MicrosoftContainerRegistry (Resource Manager only): This tag denotes the address prefixes of the Microsoft Container Registry service. If you specify MicrosoftContainerRegistry for the value, traffic is allowed or denied to MicrosoftContainerRegistry. If you only want to allow access to MicrosoftContainerRegistry in a specific region, you can specify the region in the following format MicrosoftContainerRegistry. [region name]. AzureContainerRegistry (Resource Manager only): This tag denotes the address prefixes of the Azure Container Registry service. If you specify AzureContainerRegistry for the value, traffic is allowed or denied to AzureContainerRegistry. If you only want to allow access to AzureContainerRegistry in a specific region, you can specify the region in the following format AzureContainerRegistry. [region name]. AppService (Resource Manager only): This tag denotes the address prefixes of the Azure AppService service. If you specify AppService for the value, traffic is allowed or denied to AppService. If you only want to allow access to AppService in a specific region, you can specify the region in the following format AppService. [region name]. AppServiceManagement (Resource Manager only): This tag denotes the address prefixes of the Azure AppService Management service. If you specify AppServiceManagement for the value, traffic is allowed or denied to AppServiceManagement. ApiManagement (Resource Manager only): This tag denotes the address prefixes of the Azure Api Management service. If you specify ApiManagement for the value, traffic is allowed or denied to ApiManagement. AzureConnectors (Resource Manager only): This tag denotes the address prefixes of the Azure Connectors service. If you specify AzureConnectors for the value, traffic is allowed or denied to AzureConnectors. If you only want to allow access to AzureConnectors in a specific region, you can specify the region in the following format AzureConnectors. [region name]. GatewayManager (Resource Manager only): This tag denotes the address prefixes of the Azure Gateway Manager service. If you specify GatewayManager for the value, traffic is allowed or denied to GatewayManager. AzureDataLake (Resource Manager only): This tag denotes the address prefixes of the Azure Data Lake service. If you specify AzureDataLake for the value, traffic is allowed or denied to AzureDataLake. AzureActiveDirectory (Resource Manager only): This tag denotes the address prefixes of the AzureActiveDirectory service. If you specify AzureActiveDirectory for the value, traffic is allowed or denied to AzureActiveDirectory. AzureMonitor (Resource Manager only): This tag denotes the address prefixes of the AzureMonitor service. If you specify AzureMonitor for the value, traffic is allowed or denied to AzureMonitor. ServiceFabric (Resource Manager only): This tag denotes the address prefixes of the ServiceFabric service. If you specify ServiceFabric for the value, traffic is allowed or denied to ServiceFabric. AzureMachineLearning (Resource Manager only): This tag denotes the address prefixes of the AzureMachineLearning service. If you specify AzureMachineLearning for the value, traffic is allowed or denied to AzureMachineLearning. BatchNodeManagement (Resource Manager only): This tag denotes the address prefixes of the Azure BatchNodeManagement service. If you specify BatchNodeManagement for the value, traffic is allowed or denied from the Batch service to compute nodes. Service tags of Azure services denotes the address prefixes from the specific cloud being used. 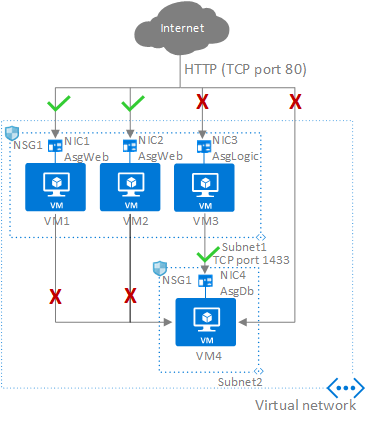 If you implement a virtual network service endpoint for a service, such as Azure Storage or Azure SQL Database, Azure adds a route to a virtual network subnet for the service. The address prefixes in the route are the same address prefixes, or CIDR ranges, as the corresponding service tag. In the Source and Destination columns, VirtualNetwork, AzureLoadBalancer, and Internet are service tags, rather than IP addresses. In the protocol column, All encompasses TCP, UDP, and ICMP. When creating a rule, you can specify TCP, UDP, or All, but you cannot specify ICMP alone. Therefore, if your rule requires ICMP, select All for protocol. 0.0.0.0/0 in the Source and Destination columns represents all addresses. Clients like Azure portal, Azure CLI, or Powershell can use * or any for this expression. You cannot remove the default rules, but you can override them by creating rules with higher priorities. This rule is needed to allow traffic from the internet to the web servers. Because inbound traffic from the internet is denied by the DenyAllInbound default security rule, no additional rule is needed for the AsgLogic or AsgDb application security groups. Because the AllowVNetInBound default security rule allows all communication between resources in the same virtual network, this rule is needed to deny traffic from all resources. This rule allows traffic from the AsgLogic application security group to the AsgDb application security group. The priority for this rule is higher than the priority for the Deny-Database-All rule. As a result, this rule is processed before the Deny-Database-All rule, so traffic from the AsgLogic application security group is allowed, whereas all other traffic is blocked. The rules that specify an application security group as the source or destination are only applied to the network interfaces that are members of the application security group. If the network interface is not a member of an application security group, the rule is not applied to the network interface, even though the network security group is associated to the subnet. There are limits to the number of application security groups you can have in a subscription, as well as other limits related to application security groups. For details, see Azure limits. You can specify one application security group as the source and destination in a security rule. You cannot specify multiple application security groups in the source or destination. All network interfaces assigned to an application security group have to exist in the same virtual network that the first network interface assigned to the application security group is in. For example, if the first network interface assigned to an application security group named AsgWeb is in the virtual network named VNet1, then all subsequent network interfaces assigned to ASGWeb must exist in VNet1. You cannot add network interfaces from different virtual networks to the same application security group. If you specify an application security group as the source and destination in a security rule, the network interfaces in both application security groups must exist in the same virtual network. For example, if AsgLogic contained network interfaces from VNet1, and AsgDb contained network interfaces from VNet2, you could not assign AsgLogic as the source and AsgDb as the destination in a rule. All network interfaces for both the source and destination application security groups need to exist in the same virtual network. To minimize the number of security rules you need, and the need to change the rules, plan out the application security groups you need and create rules using service tags or application security groups, rather than individual IP addresses, or ranges of IP addresses, whenever possible. You can deploy resources from several Azure services into an Azure virtual network. For a complete list, see Services that can be deployed into a virtual network. You can associate zero, or one, network security group to each virtual network subnet and network interface in a virtual machine. The same network security group can be associated to as many subnets and network interfaces as you choose. For inbound traffic, Azure processes the rules in a network security group associated to a subnet first, if there is one, and then the rules in a network security group associated to the network interface, if there is one. VM1: The security rules in NSG1 are processed, since it is associated to Subnet1 and VM1 is in Subnet1. Unless you've created a rule that allows port 80 inbound, the traffic is denied by the DenyAllInbound default security rule, and never evaluated by NSG2, since NSG2 is associated to the network interface. If NSG1 has a security rule that allows port 80, the traffic is then processed by NSG2. To allow port 80 to the virtual machine, both NSG1 and NSG2 must have a rule that allows port 80 from the internet. VM2: The rules in NSG1 are processed because VM2 is also in Subnet1. Since VM2 does not have a network security group associated to its network interface, it receives all traffic allowed through NSG1 or is denied all traffic denied by NSG1. Traffic is either allowed or denied to all resources in the same subnet when a network security group is associated to a subnet. VM3: Since there is no network security group associated to Subnet2, traffic is allowed into the subnet and processed by NSG2, because NSG2 is associated to the network interface attached to VM3. VM4: Traffic is allowed to VM4, because a network security group isn't associated to Subnet3, or the network interface in the virtual machine. All network traffic is allowed through a subnet and network interface if they don't have a network security group associated to them. For outbound traffic, Azure processes the rules in a network security group associated to a network interface first, if there is one, and then the rules in a network security group associated to the subnet, if there is one. VM1: The security rules in NSG2 are processed. Unless you create a security rule that denies port 80 outbound to the internet, the traffic is allowed by the AllowInternetOutbound default security rule in both NSG1 and NSG2. If NSG2 has a security rule that denies port 80, the traffic is denied, and never evaluated by NSG1. To deny port 80 from the virtual machine, either, or both of the network security groups must have a rule that denies port 80 to the internet. VM2: All traffic is sent through the network interface to the subnet, since the network interface attached to VM2 does not have a network security group associated to it. The rules in NSG1 are processed. VM3: If NSG2 has a security rule that denies port 80, the traffic is denied. If NSG2 has a security rule that allows port 80, then port 80 is allowed outbound to the internet, since a network security group is not associated to Subnet2. VM4: All network traffic is allowed from VM4, because a network security group isn't associated to the network interface attached to the virtual machine, or to Subnet3. You can easily view the aggregate rules applied to a network interface by viewing the effective security rules for a network interface. You can also use the IP flow verify capability in Azure Network Watcher to determine whether communication is allowed to or from a network interface. IP flow verify tells you whether communication is allowed or denied, and which network security rule allows or denies the traffic. Network security groups are associated to subnets or to virtual machines and cloud services deployed in the classic deployment model, and to subnets or network interfaces in the Resource Manager deployment model. To learn more about Azure deployment models, see Understand Azure deployment models. Unless you have a specific reason to, we recommended that you associate a network security group to a subnet, or a network interface, but not both. Since rules in a network security group associated to a subnet can conflict with rules in a network security group associated to a network interface, you can have unexpected communication problems that require troubleshooting. Virtual IP of the host node: Basic infrastructure services such as DHCP, DNS, IMDS, and health monitoring are provided through the virtualized host IP addresses 168.63.129.16 and 169.254.169.254. These IP addresses belong to Microsoft and are the only virtualized IP addresses used in all regions for this purpose. Licensing (Key Management Service): Windows images running in virtual machines must be licensed. To ensure licensing, a request is sent to the Key Management Service host servers that handle such queries. The request is made outbound through port 1688. For deployments using default route 0.0.0.0/0 configuration, this platform rule will be disabled. Virtual machines in load-balanced pools: The source port and address range applied are from the originating computer, not the load balancer. The destination port and address range are for the destination computer, not the load balancer. 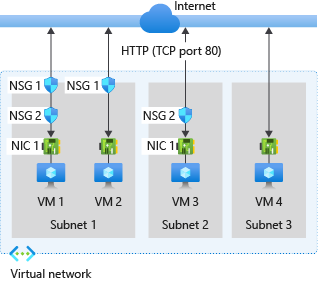 Azure service instances: Instances of several Azure services, such as HDInsight, Application Service Environments, and Virtual Machine Scale Sets are deployed in virtual network subnets. For a complete list of services you can deploy into virtual networks, see Virtual network for Azure services. Ensure you familiarize yourself with the port requirements for each service before applying a network security group to the subnet the resource is deployed in. If you deny ports required by the service, the service doesn't function properly. Sending outbound email: Microsoft recommends that you utilize authenticated SMTP relay services (typically connected via TCP port 587, but often others, as well) to send email from Azure Virtual Machines. SMTP relay services specialize in sender reputation, to minimize the possibility that third-party email providers reject messages. Such SMTP relay services include, but are not limited to, Exchange Online Protection and SendGrid. Use of SMTP relay services is in no way restricted in Azure, regardless of your subscription type. Enterprise Agreement: Outbound port 25 communication is allowed. You are able to send outbound email directly from virtual machines to external email providers, with no restrictions from the Azure platform. Pay-as-you-go: Outbound port 25 communication is blocked from all resources. If you need to send email from a virtual machine directly to external email providers (not using an authenticated SMTP relay), you can make a request to remove the restriction. Requests are reviewed and approved at Microsoft's discretion and are only granted after anti-fraud checks are performed. To make a request, open a support case with the issue type Technical, Virtual Network Connectivity, Cannot send e-mail (SMTP/Port 25). In your support case, include details about why your subscription needs to send email directly to mail providers, instead of going through an authenticated SMTP relay. If your subscription is exempted, only virtual machines created after the exemption date are able to communicate outbound over port 25. MSDN, Azure Pass, Azure in Open, Education, BizSpark, and Free trial: Outbound port 25 communication is blocked from all resources. No requests to remove the restriction can be made, because requests are not granted. If you need to send email from your virtual machine, you have to use an SMTP relay service. Cloud service provider: Customers that are consuming Azure resources via a cloud service provider can create a support case with their cloud service provider, and request that the provider create an unblock case on their behalf, if a secure SMTP relay cannot be used. If Azure allows you to send email over port 25, Microsoft cannot guarantee email providers will accept inbound email from your virtual machine. If a specific provider rejects mail from your virtual machine, work directly with the provider to resolve any message delivery or spam filtering issues, or use an authenticated SMTP relay service. Learn how to Create a network security group.